The eighteenth century is in many ways the most problematic era in Irish history. Traditionally, the years from 1700 to 1775 have been short-changed by historians, who have concentrated overwhelmingly on the last quarter of the period. Professor Ian McBride’s survey, the fourth in the New Gill History of Ireland series, seeks to correct that balance. At the same time it provides an accessible and fresh account of the bloody rebellion of 1798, the subject of so much controversy. The eighteenth century was the heyday of the Protestant Ascendancy. Professor McBride explores the mental world of Protestant patriots from Molyneux and Swift to Grattan and Tone. Uniquely, however, McBride also offers a history of the eighteenth century in which Protestant, Catholic and Dissenter all receive due attention. One of the greatest advances in recent historiography has been the recovery of Catholic attitudes during the zenith of the Protestant Ascendancy. 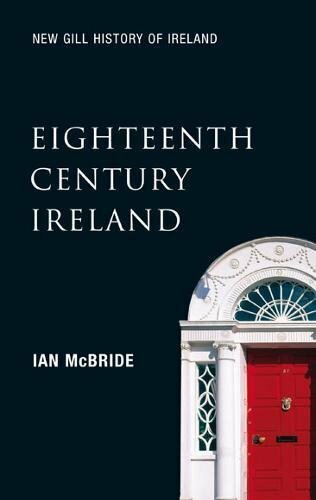 Professor McBride’s Eighteenth-Century Ireland insists on the continuity of Catholic politics and traditions throughout the century so that the nationalist explosion in the 1790s appears not as a sudden earthquake, but as the culmination of long-standing religious and social tensions. McBride also suggests a new interpretation of the penal laws, in which themes of religious persecution and toleration are situated in their European context. This holistic survey cuts through the clichés and lazy thinking that have characterised our understanding of the eighteenth century. It sets a template for future understanding of that time. What Were the Penal Laws For?